I had a very nice talk with the General Cigar reps that accompanied Leo and since Leo doesn’t speak English my conversation was limited to the reps (have got to get my Spanish back!). I’m not so sure if it’s the lack of offerings in the line or if their marketing just doesn’t connect, but I pretty much think of all Gloria products as maduro and non-maduro. I have a few series R’s and have had the N’s and so I purchased the new Artesanos Retro Especiale which is a new blend and breed with a Connecticut seed wrapper grown in Honduras in order to achieve a new cigar experience. It also has a unique binder of a Nicaraguan and Mexican leaf that adds the uniqueness that boutique cigar lovers are looking for these days. I was able to smoke this cigar the other day around noon (didn’t get to finish of course) and it was a very nice tasting cigar. It is not a heavy cigar (Artesanos Retro Especiale), it’s more of a medium-ish in strength but does deliver some nuances that an enthusiast will appreciate. The more I get to learn about cigars and follow industry news you get the appreciation that a cigar is not as simple as a bunch of leaves rolled up. A blender, these days, is trying to deliver strength and taste. These two seem to be hard to corral into a cigar. Taste is something that is quite subjective also, so there is no guarantee that everyone will appreciate what a blender is doing. I liked this cigar and am glad I have another one. 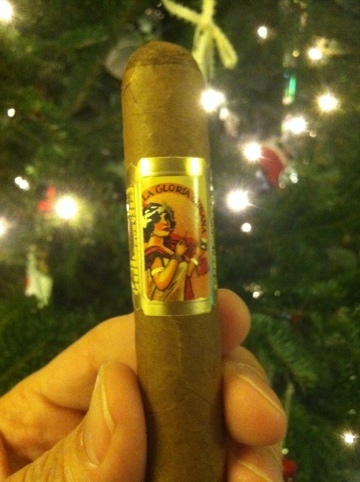 The other product I purchased was a La Gloria Cubana figurado that was rolled special for the holiday season. I took a picture but due to being outside and dark, the image is horrible. I think you can only find this for a limited time. Look at the red band, that is quite different and may lead you to it. 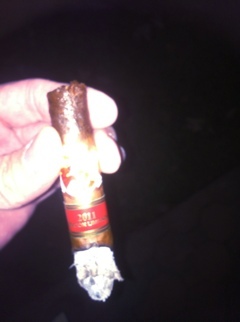 In short, it was a very nice smoke, maybe a medium to full in strength and very tasty! If you catch this rolling event somewhere you should be able to happen upon one. This event is was very beneficial for myself. I have not just a new understanding of what the La Gloria Cubana brand is about but more importantly a new curiosity about its products and I will be trying more of their products. 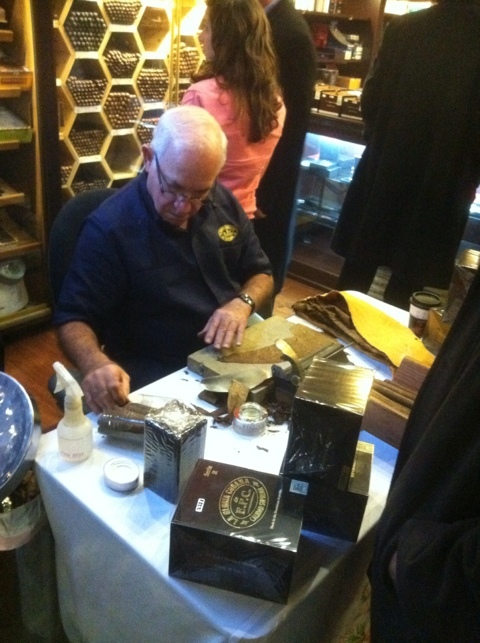 I did get a special Artesanos de Tabaqueros cigar from the General Cigar rep and will be trying it soon. It is quite unique, two different wrappers on it, very unique not only in type but color and should be an interesting challenge to my palate. Although thought of as a good value cigar, I think this brand has the potential to move up in my world, in at least my mind, as a must-try brand.